Bridge Magazine has been named 2015 Newspaper of the Year, sweeping awards in two reporting categories and earning more than a dozen awards overall in the Michigan Press Association Better Newspaper Contest. 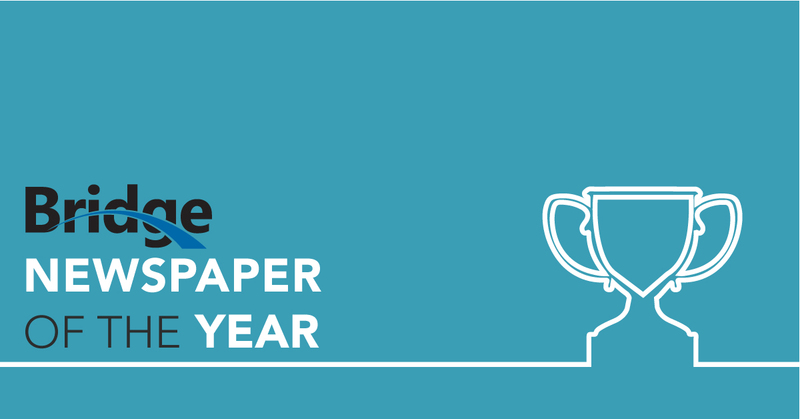 Less than five years after publishing its first article, Bridge Magazine has been named Newspaper of the Year, sweeping awards in two reporting categories and earning more than a dozen awards overall in the Michigan Press Association Better Newspaper Contest. Bridge also earned top honors for Public Notice Journalism, and an article by Bridge Staff Writer Chastity Pratt Dawsey was hailed as the best writing in any publication in the state in 2015. The MPA’s Better Newspaper Contest drew 3,833 entries from 113 Michigan publications. The nonprofit Bridge Magazine is the journalistic arm of the nonpartisan Center for Michigan, a “think-and-do” tank founded by former newspaper publisher Phil Power in 2006. The Center’s objective is to make Michigan a better place by encouraging greater understanding and involvement in policy issues among the people of Michigan and making sure their voices are regularly heard. Bridge was named Newspaper of the Year among weekly/specialty publications with a circulation of more than 20,000. The MPA Public Notice Journalism Award, recognizing stories that exemplify the importance of public notice in newspapers. Bridge won the award for “Michigan’s job rebound also brings lower paychecks,” a series written by Pratt Dawsey and Ted Roelofs. First place for spot news, for “Officials' mistake cancels Head Start in district; sin and a shame for district,” by Pratt Dawsey. First place for news enterprise reporting, for Bridge’s investigative series examining the state’s response to prison sexual assaults of juvenile offenders, by Roelofs and Ron French. First place, government and education news, for “Why college costs so much,” a series by French. First place, business and agriculture news, “Poverty in Paradise,” a series of stories examining the economic chasm between rich and poor in “Pure Michigan" up north, by Nancy Derringer, Roelofs and Mike Wilkinson. This project also took third place in the Herbert Spencer Best Writing category. First place, feature story, “One teacher, 25 kids: A Detroit teacher goes to work,” by Pratt Dawsey. First place, photo story, for “Last stand of the one-room schoolhouse,” by Brian Widdis. Second place, government and education news, “How a single, powerful senator killed serious reform of teacher evaluation,” a story chronicling the behind-the-scenes sausage-making that sometimes goes on in Lansing, by French. Third place, government and education news, “Rough road ahead,” a series examining Michigan’s infrastructure problems, by Pat Shellenbarger and Wilkinson. Second place, business and agriculture news, for “More jobs, less pay,” stories chronicling profound economic changes that have reshaped lives across Michigan, by Roelofs, Pratt Dawsey and Wilkinson. Third place, business and agriculture news, “Twenty years after NAFTA, a mini-Detroit rises in Mexico,” by Serena Maria Daniels. Second place, best column, Phil Power, for a collection of columns. Second place, most innovative storytelling, “The crazy cost of college, a cultural timeline,” by French, AJ Jones and Wilkinson. Well done and well deserved. At a time when the type of credible and in-depth journalism provided by The Bridge Magazine is more needed than ever, it is becoming more and more rare. I am appreciative of the level of talent and critical thinking skills exhibited by all who write for this publication. Congratulations! Congratulations on the recognition for your excellent work. Well deserved! I especially appreciate your in-depth looks at issues of poverty and education. I don't always agree with angles and opinions here, but I respect the integrity of your efforts. The hiring of hire Chastity was a very wise move. Congratulation, these honors attest to Bridge/staff having created such a good environment that quality work shines brightly on all. Thanks to the recognized individuals for their good work and all who work with them supporting Bridge. Congrats on the well-deserved recognition. Keep up the good work!